This is another one from a 1950’s Valentine Cut Out Book! This one shows a Double Heart with an Arrow going through it. The original is at the top and I’ve created a second version without the message and without the border, so that you can add your own words. 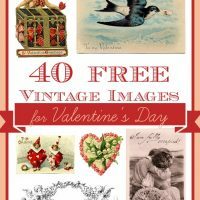 Nice for your Valentine’s Day Craft or Card Projects! 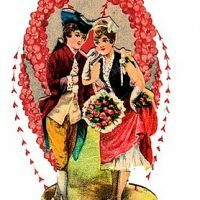 Vintage German Valentine 40 Free Valentine’s Day Images! Vintage Arrows Frame Image! Love this double heart! And thanks for sharing a blank version too! Definitely will come in handy. Thanks Karen – love the blank version. So cute!! Thanks, as always, for the extra version too! Karen, thank you so much for the wonderful images you always have here to share with us!!!! First timer…. Love the retro ones the best! but all of them are beautiful and unique.